I recently listened to Triangulation episode #278 with Tim Wu, author of The Attention Merchants (which I'm currently reading). Tim, and Leo, both stated in the podcast that getting people to pay for content is hard, which is why advertising supported content is so prevalent. There are of course others, this isn't an exhaustive list. In 1986 the film Top Gun opened. In 1987 it was released on VHS with an interesting twist. This was one of the first, if not the first, home movie release to feature a commercial, Diet Pepsi, prior to the movie opening. It set the stage for commercials to be shows before the actual video in home movie releases from then on. It also paved the way for commercials to be shown in movie theaters both before the start of the film and during the previews. That's over 90+ things that wanted to download! 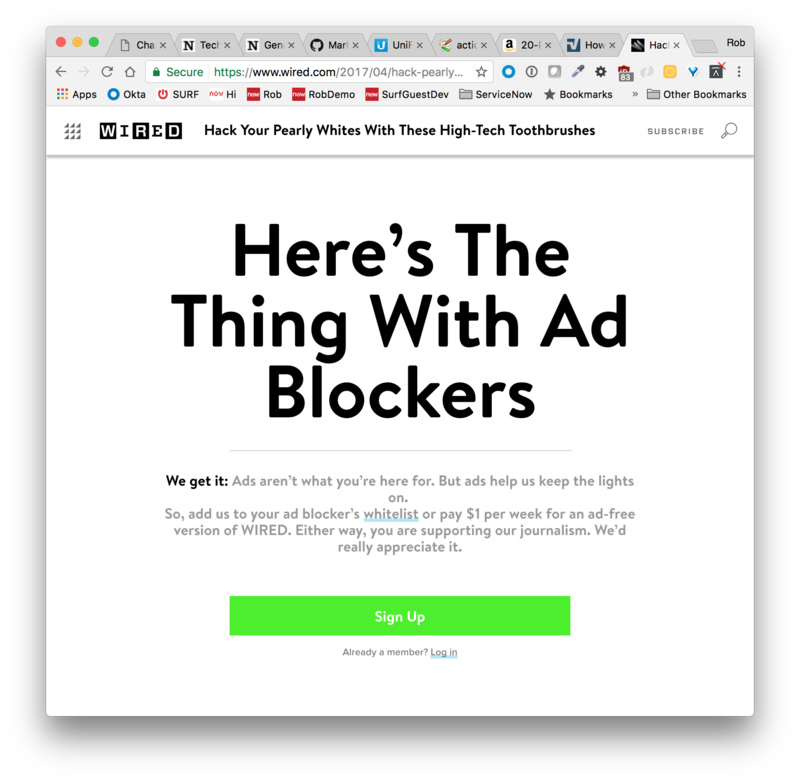 The problem with all of these "things" is that not only are they providing advertisements, they're also invading your privacy, and downloading to your computer slowing down the page. Additionally, since many are on sites not controlled by Wired, they could potentially be harmful to your computer. 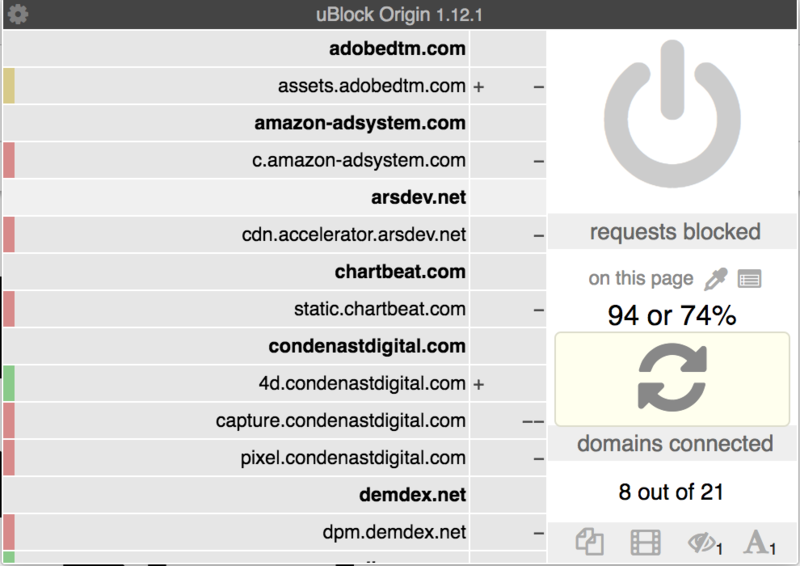 Those last two issues are the primary reason I run uBlock Origin: to speed up page loads and to protect my computer from Malware. The issue isn't that I don't want to pay for content, the biggest issue is that the content creators don't want me to pay. They make more money by slapping advertising all over it. Why else would the major networks: ABC, CBS, NBC, Fox, HBO, Showtime, Netflix, CW, FX, USA, etc. make me pay for subscriptions to their channels to see their content, over just paying for the content I want to see? Want to see Game of Thrones? You have to be a subscriber. Want to see Mr. Robot? Subscribe. The other issue with this type of content is that the preferred medium for consumers is to stream it. I'm not interested in owning the content and having the rights to watch it an unlimited number of times. I don't want to watch Westworld Season 1, Episode 2 more than one time. As such, I'm not interested in buying it from iTunes. I'd prefer to pay a MUCH lower fee to stream it once. However, again, this model isn't available for much of the content I want to consume. I either have to purchase it outright, or else subscribe to a large pool of content in order to see the one show I want. That model also assumes I can even purchase and/or stream the content I want to see. Go try to stream Disney's The Lion Guard (a great series of cartoons that take place after The Lion King). You cannot, it doesn't exist anywhere to stream (at the moment). You an purchase it outright from iTunes, but that's it. The vast majority of the content my family consumes are movies for my 6 year-old son. We watch them over and over again and, as such, I was happy to purchase them outright and will continue to do so. However, I'm paying over $100 / month in order to have Cable TV, for no other reason than the ability to have access to SyFy, HBO, and Showtime to watch the content that my wife and I enjoy during the 1-2 hours a day we're able to consume it. I've thought about purchasing subscriptions to these services directly; however, SyFy doesn't offer one, and combined HBO and Showtime subscriptions would cost me $26 / month alone. Additionally, thanks to the lack of net neutrality, I have to have a Cable TV subscription in order to avoid bandwidth caps from my Internet provider...so what's the point of "cutting the cord" if you're going to pay more to cut it? However, there is a flip-side to this argument. Content creation isn't an exact science. For every Game of Thrones, there are dozens of John from Cincinnati and Luck series that did poorly. In order to keep producing content people want to watch, you have to fund content they don't, because you cannot be sure what will sell and what won't. As will all things, moderation is the solution to this problem. Content owners have to provide content to be consumed the way that people wish to consume it, at a reasonable charge. Further, consumers need to understand that not all content can be easily monetized individually and that advertisements are a necessary part of that consumption. Within reason. Further, the content producers need to take ownership over the advertising networks to ensure the safety of consumers. This cannot be stressed enough, automated advertising networks will always be plagued with Malware, more care needs to be taken to provide safe advertisements that do not misbehave. Google is attempting to do this with AMP, but it's only for mobile platforms and hasn't caught on. I don't want free content, I want the artists, the producers, and the distributors to stay in business and make a living. Likewise, I'm not willing to sacrifice my privacy and the safety of my computing environments to consume content. Let's meet in the middle.